The Heater Jr. Pitching Machine is so versatile and affordable, anyone can improve their batting average in no time. 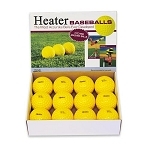 Featuring a 12 ball automatic ball feeder that throws a pitch every ten seconds, the Heater Jr. Pitching Machine lets you practice whenever you want, all by yourself. 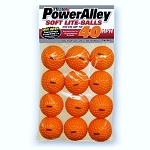 Its impressive 1/4 horsepower motor can be adjusted to throw lite-balls or baseballs from 15 miles per hour to 48 miles per hour. With an easy height adjustment control, it can also be set up to throw grounders and pop-flies for great solo fielding practice. The Heater Jr. s motor is housed in resilient nylon-fiberglass and stands on durable galvanized steel tubing legs, making it both lightweight and high-impact resistant. Like all Heater products, the Heater Jr. Pitching Machine features a 1 year manufacturer's warranty and 30-day money-back guarantee, too! PLEASE NOTE: Although the Heater Jr. can throw regulation baseballs, it is recommended that you use approved Heater baseballs, instead. They not only fly straighter, they are far less damaging to pitching machine wheels than real leather balls are. 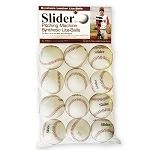 Please see the Approved Balls tab, above, for a list of all of the Heater balls that can be used with this pitching machine. To ensure your satisfaction, the Heater Jr. Pitching Machine includes a 30 Day Money Back Guarantee. Heater Jr pitching machines are also backed by a Full 1 Year Warranty that includes repair, replacement and labor. No matter where you order a Heater Jr. Baseball Pitching Machine from, NOBODY actually stocks them; they all ship directly from the manufacturer's warehouse located in St. George, Utah. Therefore, the shipping time frame is exactly the same no matter what website you order from (we hope that it is this one!). 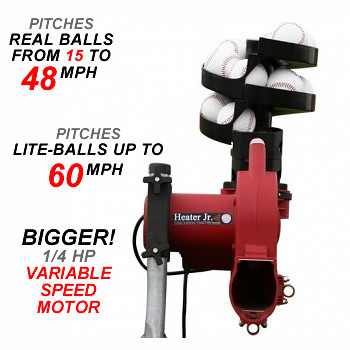 Heater Jr Pitching Machines typically take 2-4 business days to ship from the time you place your order. They ship via Federal Express (FedEx) Ground and could take anywhere from a day or two to a week to get to you AFTER being shipped, depending on your proximity to their warehouse. We will notify you of your tracking number the moment we receive it from the manufacturer's warehouse. Click here to download an easy to read, printable PDF of the Heater Jr. Baseball Pitching Machine Owner's Manual.